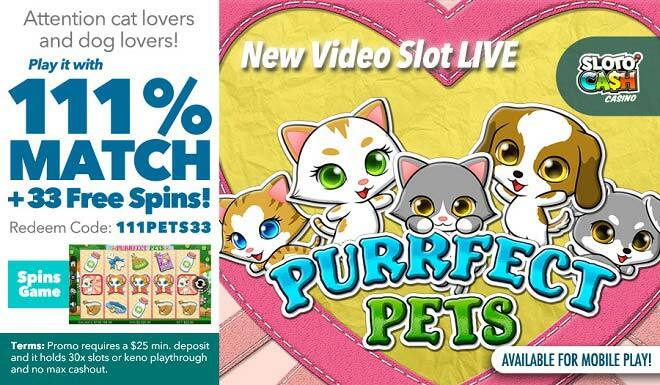 New Video Slot: Get ready for Cuteness and Wins Overload in Purrfect Pets! Meows, woofs and wins – that’s what you can expect when spinning Mr. Sloto’s latest slot addition: Purrfect Pets! Get ready to embrace some seriously cute wins that multiply when you deposit as little as $25 to play with a 111% Match + 33 Free Spins! With 5 reels and 25 paylines, there are plenty of winning chances that occur when you land symbols like cats, dogs, mouse cat toys, food bowls, collars, bones, milk, and more pet related items. Play up to 10 free spins and the fun Cats vs. Dogs bonus feature and the Doggy Dollars game for even more wins! Start cuddling with your favorite pets and wins when spinning ‘Purrfect Pets’ with a 111% Match + 33 Free Spins! Promo requires a $25 min. deposit and it holds 30x slots or keno playthrough and no max cashout.